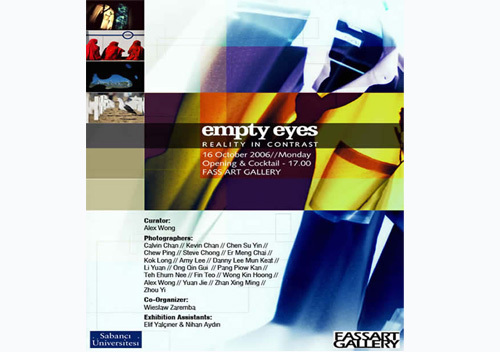 An exhibiton of nineteen Asian photographers from China, United States, Malaysia and Singapore. The exhibited works ranging from classical to contemporary photography. The purpose is not to distinguish which photographs is better, more popular or outstanding in style and technique. But to share and search for a common ground of understanding and the cohesive existence of each other, regardless the status from professional to amatuer photographers. A direct repulsive action reacts through the first contact of our eyes. Our search for the "right" takes us too far, too deep as we seek it in the unknown and mysterious moment ahead, whereas it is waiting for us, besieging us on all sides. As if every moment anything can happen in front of our eyes before we could realize and process the reality of fact. It's our eyes appeared lifeless, dead and empties not the mind. Try closing your eyes and start imagining, the imagination could be uplifting even healing but the reality often appears in contrast when you open them. All we need to do is simply open our eyes, to leave the dark world of metaphysics behind and the false depths of the 'inner life' behind, and we will discover the immense human wealth that the humblest facts of everyday life contain. "The familiar is not necessarily the known," said Hegel. Let us go farther and say that it is in the most familiar things that the unknown, not the mysterious, is at its richest, and this rich content of life is still beyond our empty, darkling consciousness, inhabited as it is by imposters and gorged with the forms of pure reason. We should not let the eyes be empty but try to fill the emptiness in a different point of view and always ready to open and adjust ourselves according to the contrast opinion and reality. A reality that is farther than our eyes. All faculties member and student are welcome to cocktail. Exhibit setup/assistant:Nihan Aydin, Elif G.Yalciner, Basak Sena Engin and Sena Arcak.